I am feeling sick today, so I'm going to forgo any intense projects. 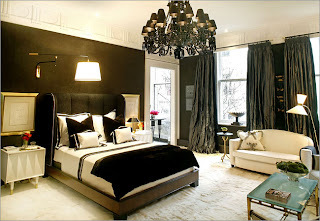 I thought I'd do a bit of web-surfing and show some pictures about how color affects a room. These pictures were pretty intriguing. I have painted the walls in my house numerous times. I'm going to leave the actual number kind of vague because I'm pretty embarrassed by it. I am a color changing addict and I'm pretty sure we have lost square footage in our home because of how much I have painted those poor walls. 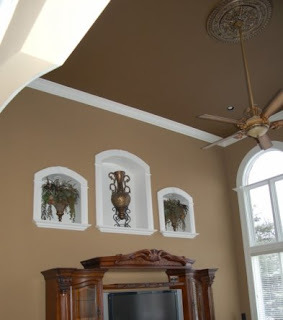 One thing I have never painted is the ceilings! It looks really appealing in some of these photos, but I think I would have to put much more consideration into the color before I took on that kind of a project. In my house the downstairs rooms excluding the bathroom are all connected. 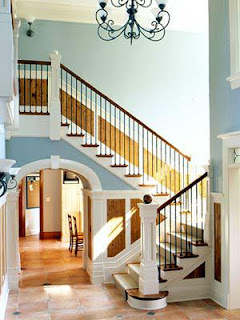 I'd have to be really careful when choosing a ceiling color because I'd have to make sure it worked in every area. Plus it's just really tiring on the arms to paint the ceiling, especially if you have really textured ceilings. Anyhoo, here are some tips on color. 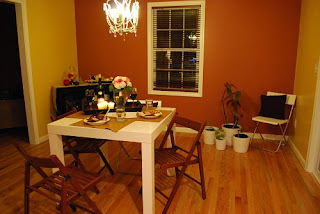 Closer: Warm colors advance, making walls seem closer. 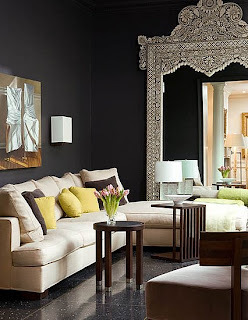 Do you have a favorite color in your home? If so, what color and what room did you use it in? I always wanted a red accent wall...we finally did it in our loft. Right now our bedroom has a striped accent wall with Brown, Blue, and Scone colored stripes...the rest of the walls are scone. Ashlynn would love something with pink and brown (I'm still trying to decide what to do.) The boys are all into the bright colors...bright blue, bright green, red, yellow, orange. And then there's the basement...I think I want to change it up from the rest of the house, but keep it pretty neutral and just add the color through art and accessories. I'll come and pick your brain when I get ready to paint! 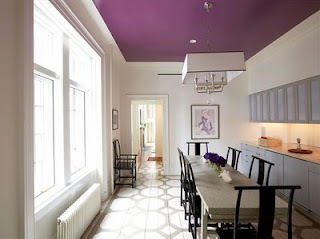 I love that purple ceiling! It creates such a fun vibe to the room. Loved all the examples you gave as well!